Where I come from (East side of Malaysia on the island of Borneo) there has been an active pottery industry for the past 150 years. These potters immigrated from the Fujian province of China and made their pottery to supply the local market and not for export. Now they mostly cater to the tourist trade. These are true genuine business and to my knowledge do not make fake reproductions. The pieces they make are of a distinct local style and it would be very hard to mistake them for Chinese antiques. There is only one style which a novice collector might get mixed up with and that style is fairly like the incised Cizhou pieces of the Song Dynasty but it has a darker glaze (usually brown or amber) and have different incised patterns. I have seen a number of different types of clay used. Some have fairly large grit in them (usually used for making flowerpots and other pieces that are of utilitarian use). I have also seen piles of a very fine paste in the factories although I have no idea where they get them. Since it is a modern business, the clay might have been imported; I really do not know. As for fakes, I think all those I saw are from Indonesia, which is not surprising since the border is only about an hour's drive away. There are many antique dealers in town and a few "free-lancers" who somehow get a few pieces and try to sell them. Everything is by word of mouth. When a new shipment comes in, almost every avid collector seems to get wind of it. Since the violence and troubles started in Indonesia a few years ago, a number of Indonesian dealers fled Jakarta, brought their entire collections, and set up shop here. Most of these are well-respected dealers and only deal with the real items. However, some dealers do both. Collectors here in Malaysia have very specific habits that dictate the prices of pieces. Qing products are not as popular and you can get a genuine Kangxi bl/w bowl for around US $ 250 sticker price. However, haggling is the norm here. Expect the final price to be about 50-60% of the sticker price. By far the most popular pieces are Yuan/Ming Longchuan Green Celedons and only the green ones! Amber celadons are not popular. In addition, among the green celadons, the most prized pieces are the large platters or chargers which can bring many thousands of dollars; that is if you find one for sale. Large Jars are also popular. There is a great variety of jars here from Thai, Khmer, Martaban, and Chinese. Many of these jars are huge, standing over a meter tall and are prominently displayed in the houses of collectors. Like other pieces, the oldest jars date back to the Song period when trade was established between SE Asia and South China. However, I have seen pieces that look like Han and Warring states with their cloth patterns, for sale. It is difficult for me to say if these are real or not. Back to the point about fakes. Reproductions from Indonesia vary in quality. Some pieces are obvious. Others are not! Some of them are expertly made fakes that would fool the best collectors. When I went back last time I spent many hours shifting in the dealer's shop that I mentioned earlier and some others, simply studying fakes. When I shop I always go to a dealer that simply buys everything - both fake and real. He does not concern whether the items are real or not. He simply sells them at a set mark up for what he originally bought them for. Therefore, for those collectors that really know their stuff, his shop can be a treasure chest of real deals; IF you know what to look for. Vary in quality. Some of them have satin like glaze others more matte and rougher like. I examined a pair of Meiping jars. Cobalt patterns were very dark, with a lot of iron oxide heap and piling effect. However it was way TOO much heap and piling effect. Almost everywhere the blue was, there were large black iron spots. Just made the piece look strange. However, the patterns to me seemed very authentic, with the typical scrolls, friezes lotus petals at the bottom. The shape of the Meiping followed the shapes of the 15th century (i.e. thinner and more slender). The jars were heavy and thick walled. The base had some sort of dark oily paste like surface that made it look rather old. It was also very rough, like touching a road surface where you can feel bumps and the unevenness of the individual gravel. It did not have "chatter marks" nor the typical reddish clay look. I also examined a pair of B/W pear shaped vases. They looked just like the image sent to you. One was exactly like that, the other had a landscape painting on it but had the same top and bottom decorations. Both pieces were extremely heavy for their size. The weight distribution was very uneven. From the mid point up the rim the clay wall seemed thinner. While the clay wall at the bottom seems much thicker. It is difficult to describe the feel of holding up a piece which such an uneven weight! The best I can do to describe it is holding exercise weights. Imagine if you have one of those weights in your hand. One end of the weight is 1 kg and the other side is 0.5 kg. The glaze is very smooth and unlike the Meipings, had NO iron spots at all! The cobalt was also lighter and much more realistic in appearance. The bottom had a circular and deep cut marks running from the outside in but no traces of red clay. Instead, it was pale clay that was stained darker by something. In my opinion, it was very convincing! Much easier to spot in my opinion. Real Lungchuan pieces are dense and very heavy stoneware. The large platters are extremely heavy! The fakes do not come close to that. The fakes have more porous and less well fired clay. To those that heave heard it, there is no sound like tapping a well fired Celadon bowl. It sounds like a bell and music to my ears! The fakes cannot produce that sound cause they use lower quality clay and firing. The fakes tend to feel more as Thai Sawankhalok pieces i.e. lighter and more porous feel. In addition, Lungchuan glazes are very different. The glaze is thick, covers the pieces like honey, feels like satin to the touch, and is not very transparent. The fakes have a thin glassy like transparent glaze with quite a lot of tiny crackles. In addition, the green is of a wrong tint. The base shows no sign of a support ring that is usually found on real pieces. I also went to a shop of a well-respected dealer. He showed me some fake B/W pieces he had so I could learn. 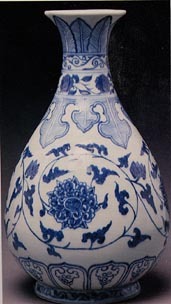 One that made me surprised was a little Ming style ewer with long spout like the image I sent you. (The picture is of a genuine one). This one had discolored crackles. I am sure you have seen pieces that had been buried. Minute particles of dirt get into the crackles and stain them yellowish or orange. They cannot be washed out and usually is a sign of a piece's authenticity. However this fake piece had such crackles that I always thought were impossible to replicate! The fake makers had found a way to make such discolored crackles. I examined them closely and they were discolored just the way you expect. There were only two things that might raised suspicions about these crackles. One is that the discolorations tended to be a little dark compared to the rest of the ewer that showed no signs of burial. The glaze was still shiny and white. The darker crackles stood out against the white glaze just too much. In addition, the crackles were not even. For one their size was too large and looked more like hairline cracks instead. In addition, it was to one side of the ewer. The other side was fresh and clean. 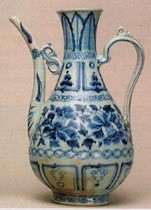 Overall, the crackles made the ewer look "strange". The bottom was clean and white. The inside of the little lid that it had was very roughly cut. P.S Just to clarify! Just because some pieces have a dark oily paste at the bottom rims does not mean they are fake! I have personally seen many real pieces whose base had been discolored to a dark gray oily feel. It might have something to do with the people that originally traded these pieces many hundreds of years ago. Natives who live in the interior bought many pieces. Many pieces of these valuable antiques are still in their hands as family heirlooms and will not be sold! However, many these pieces have their bottoms stained blackish. Stained by what?